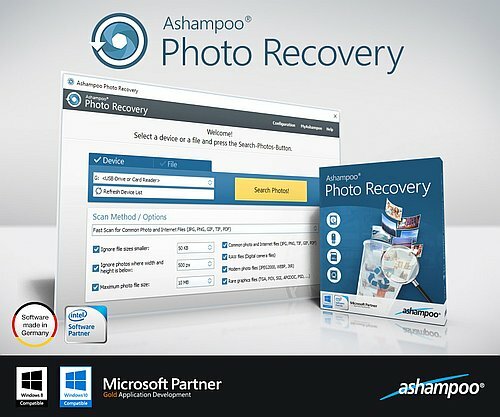 Ashampoo Photo Recovery 1.0.5 Portable » SoftLab-Portable.com - Portable Soft! Photos have been deleted by mistake. The memory card in your digital camera or cellphone is defective. A USB flash drive has been formatted or has become defective. The memory card in your cellphone has been formatted. The file system is corrupt. Convenient presets for many uses cases. The new search not only allows you to select which formats to search for but also enables you to specify a size and resolution. Supports all common file formats such as JPG, PNG, BMP, GIF and RAW. Recover metadata, e.g. EXIF or IPTC data. View photo results as thumbnails. Recover accidentally deleted or corrupted image files. Either scan individual files for contained images or entire disk drives. You can even recover your photos from damaged RAW files or formatted disks. The latest version supports the recovery of embedded images from corrupted documents (e.g. PDF, Word) and various added RAW and image formats yield even better search results. New search filters help you better manage huge file amounts and allow you to precisely filter your results either by format, size or resolution. Ashampoo is one of the leading Internet-based companies worldwide in the field of software development, sales and web portal sites.